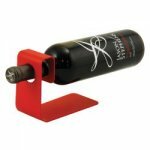 All kinds of great wine accessories and gift items to help you enjoy your wine! Check out our bottle bags, wine maps, wine glasses, decanters, corkscrews, wine buckets, wine bottle coasters, and so much more. 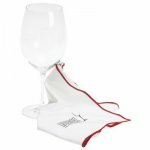 A wine accessory makes a great corporate, bridal and wine lover gift! The more you order, the more you save on delivery! Check out our delivery price for multiple accessory items! Not all accessory items are stocked at Rosehill. You may want to check availability prior to coming into our store. The Perfect Gift for any Wine Lover!! Make gift giving easy on yourself, take the guess work out of giving. 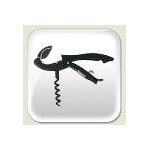 Laguiole Waiter's corkscrews and wine openers are top of the line, high quality corkscrews. Each waiter style of corkscrew is a unique design and own signature style. Corkscrews for all occasions! A variety of waiter's style corkscrew, laguiole, winged, Rogar, champagne opener and many more corkscrews. A huge number of wine openers. A corkscrew makes a great corporate gift. BEST GIFTS: Rogar, Warthog and the whole more expensive Laguiole Line. After the barrels have passed their lifespan, they are transformed into unique objects for entertaining. Decanted wine needs to be poured through a proper funnel. 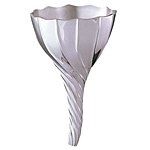 Glass, metal & pewter funnels to suit a variety of decanters. Celebrate the occasion of that special bottle of wine with the right wine funnel. A wine Coaster protects your table top from drips and allows for an elegant display of you wine bottle We also have a number of pewter Wine Coasters which match a number of other various pewter wine accessories. 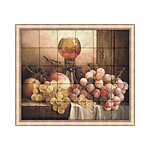 Wine coasters available for standard 750mL wine bottles and magnum. Hydrometers, hygrometers, wine thermometers and wine gauges for both your wine cellar or bottle. Digital or dial readouts. Ensure you wine cellar is at the correct temperature and humidity. Gauges are available for shipping within the USA and Canada. Wine, champagne, ice buckets in a variety of finishes and costs. Look for single wall or double wall bucket also see our oversize party beverage bin. Metal, Stainless Steel, Aluminum and Copper buckets. Why is there such a variance in cost? 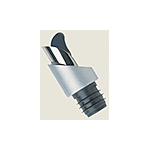 Contributing Factors: Material of the bucket, gauge of stainless steel, weight, size, double wall. Boxed Gift Sets are an excellent gift giving item. 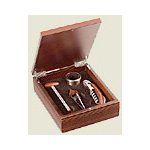 Wood, metal, fabric boxes provide beautiful presentation. Great for corporate gifts, weddings or perfect for any wine lover. 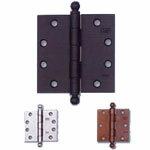 Miscellaneous wine accessories including unusual wine racks, corkscrews, buckets, coaster, preserving systems and more. Preserve your wine, once opened. Pumps and gases to assist with the saving of those open wine bottles. Wine Pumps, Ravi and Preservino will all help to enhance your wine. Hand crafted, wrought iron forged light fixtures. The perfect complement to your cellar door! 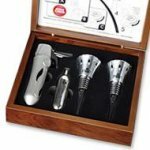 All kinds of great wine accessories and gift items to help you enjoy your wine! Check out our corkscrews (including Rogar & Laguiole), reclaimed barrel products, huge selection of buckets and so much more. A wine accessory makes a great corporate, bridal and wine lover gift or give a GIFT CERTIFICATE if you can't make up your mind. The more you order, the more you save on delivery! Check out our delivery price for multiple accessory items! Please note we have shipping minimums in place so while the initial delivery cost may seem high for the small cost for an inexpensive accessory , the more accessories you add delivery cost doesn't change by much! Wine Accessories for your Next Party! So you’re throwing a big bash? The guests are all invited and the menu is set. Now all you need are the finishing touches to ensure that your wine and cheese party is the hit of the month! 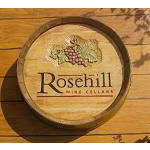 At Rosehill Wine Cellars, we have everything you need when it comes to Wine Accessories. While you can serve your fresh fruit and cheese on any old serving dish, it definitely pays off to spend a little extra on one of our recycled wine barrel products made from real wine barrels. Use one of our barrel platters or serving trays at your next party! No matter the desire, Rosehill is guaranteed to have a wide selection of Wine Accessories that will surely fulfill your needs. Whether you’d like to display your prized wine on one of our unique specialty wine racks, or protect your wooden furniture with one of our beautifully designed wine coasters, it’s a sure thing that you’ll find the Wine Accessory that you’re looking for. 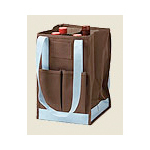 Wine buckets can also be a valuable accessory for storing your ice, wine and other beverages. Depending on the size and budget of your party, Rosehill also offers Wine Accessory Gift Sets that would make fantastic party favors or door prizes to give away at the end of the night. The sky is the limit!